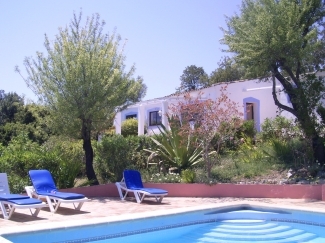 Monte Velho consists of 3 2-bedroom cottages, on a 5-acre hilltop in the unspoilt Eastern Algarve with panoramic views of the Atlantic Ocean & the Eastern Algarve�s highest peak, San Migguel. It is situated in the countryside, one mile east of the market town, Moncarapacho, on a 5-acre hilltop, covered in almond, olive & carob trees. 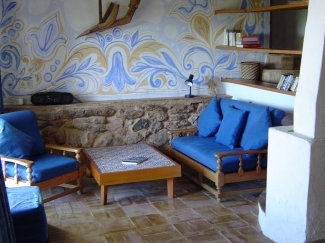 The cottages are open-plan with rustic cane ceilings, sturdy archways, & quarry-tiled floors. Diningrooms have large solid pinewood tables. The 3 kitchens all have clothes & dishwashers, microwaves, etc. Extensive patios surround pool & cottages with built-in barbeques, lounge chairs, etc. Private parking for each cottage. Superb walking country. 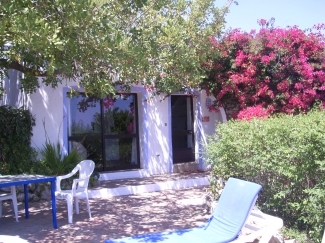 Ideally located 8kms from Fuzeta Beach & 9kms to the Algarve's largest seaport, Olh�o. We will provide a well-stocked fridge to get your holiday off to a good start, and ensure you are free to relax in the peaceful atomosphere. We also provide friendly, round the clock service, when necessary. Excellent choice to get away from it all without isolation. For one or 2 cottages only, please inquire for rates.